The schooling starts with the 7 Basic Commands. Dogs can easily handle at least 20 different commands, but these 7 basic commands are the foundation for the whole education of our dog. The name command: The dog learns his name and responds when his name is called; i.e. he looks towards you. The interdiction command: The goal here is for the dog to immediately interrupt an activity if this command is given. The reason is to protect the dog from a hazardous situation and protect the surrounding environment from the dog. Command “Sit”: With this command, the dog sits on his hind legs. Some dog schools (mainly American ones) do not teach the command ‘sit’, as they decided that this result was not useful and instead use the command ‘stand’. There are pros and cons to both these commands so it will be up to you. Command “Down”: With this command, the dog lies down. Command “Stay”: The commands ‘sit’ and ‘down’ are given when the dog is in our direct influence zone. With the ‘stay’ command the dog stays in command 3 or 4 position without moving while the owner walks away. Callback command “here”: With this command we call the dog to us. Walking “to Heel”: The command walking to heel is more difficult and can take some time. 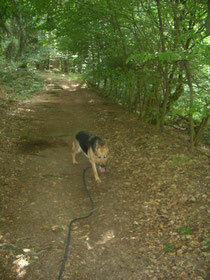 During the basic education we teach ‘heeling’ while walking on the leash. Familiarizing your dog with a muzzle is not a basic command, but we think it is important as it can be very helpful when a veterinarian has to examine your dog. The command words chosen should be clear and completely dissimilar, so that there is no confusion for the dog. Hand signals can also be used.